I read this article and found it very interesting, thought it might be something for you. The article is called When We Used To Pay 93% Tax and is located at https://archive.indiaspend.com/viznomics/when-we-used-to-pay-93-tax-2-18348. “Do you know what income tax rates were in those days?” asks the old-timer. “No”, you say somewhat skeptically. “90% my young friend, the Government of India took away everything. What do you think started the chain of black (unaccounted) money and corruption? It was crippling tax rates.”A recent Government document shows us just this. 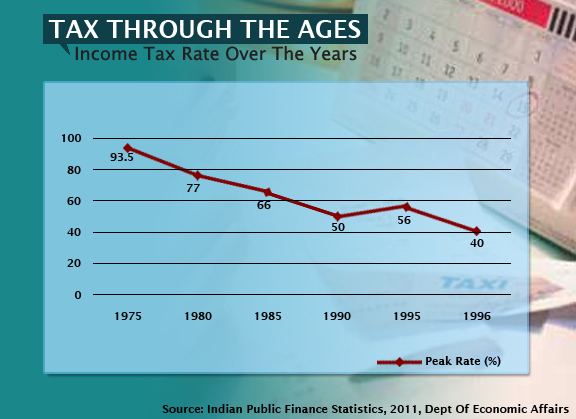 It highlights how between 1970 to 1974, any Indian resident earning more than Rs 200,000 per annum paid an income tax of 93.5%.As the table shows, it stayed above 50% right until 1995 after which tax rates came down to 40%. Needless to add, that was when economic liberalisation took hold in India and the lowering of income tax rates was accompanied by an overall lowering of tariffs and de-licensing.